Udaipur : Tension gripped the trading town of Fatehnagar, some 60 kilometers from Udaipur on Wednesday morning , after dead body of a 40-year-old man was found on a main road eighteen kilometers from the town. People staged protest on the roads, burnt tyres and shops were shut down leading to a tension-like situation that prevailed for some hours. Mavli SHO GhanshyamSingh and team identified the body to be of SatyaNarayan Aggarwal,who was the brother of a BJP councilor of Udaipur Municipal Corporation. Infuriated relatives and community people came out on roads and the market was completely shut down. Forces from five police stations were deployed to contain peace while additional forces were sent from Udaipur police line. The deceased’s family members told police that Agarwal had left home on a two-wheeler on tuesday night after he received a call on his mobile but he did not return. In the morning, people spotted the body on the roadside at Badiyar Gayriawas village on Mavli road. As the news spread of the murder, people gathered in large numbers. Family members suspected involvement of a trader who dealt in bag accessories, behind the murder who had allegedly spoken to the deceased last. 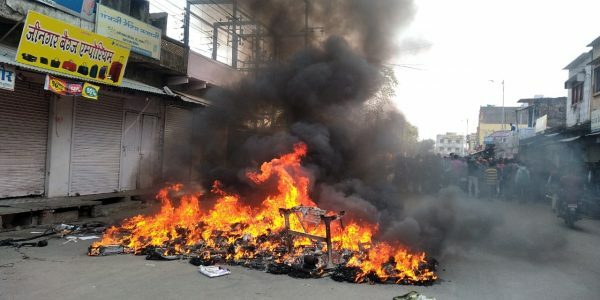 A mob forcedly entered the shop, threw the stock on the road and later set it on fire. Police pacified the people and assured them of speedy action to nab the culprits. Sources said the killers had allegedly drugged Aggarwal to kill him as no other injuries were seen on the body. Police has detained Ghanshyam Jeengar, his sons Lokesh and Chetan for interrogation. According to sources, Satyanarayan too dealt in bag accessories and was close to Lokesh. Police suspect some financial dealings to be the reason behind the murder.